This project was for the design of a new corporate headquarters and training facility for Trespa NA, the North American branch of a European building products manufacturer. In response to their rapid growth, the client purchased an undistinguished two story mixed-use tilt up structure in Poway, California. 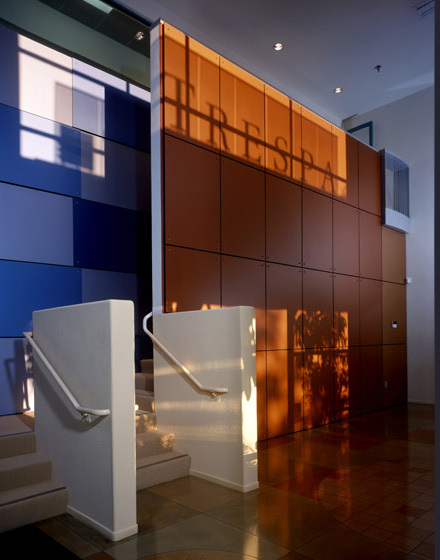 The existing structure’s organization proved to be a challenge to Trespa’s spatial program. The design solution used the existing structure to establish three large rooms, each housing a distinct administrative function; management, sales and technical, marketing and training. Each of these rooms is organized around a central object: a glass conference room, a large layout table, and a coffee bar wall. Office/workstations are then organized around these objects. Architectural elements within the space are developed to enhance the sense of spaciousness within the rooms. 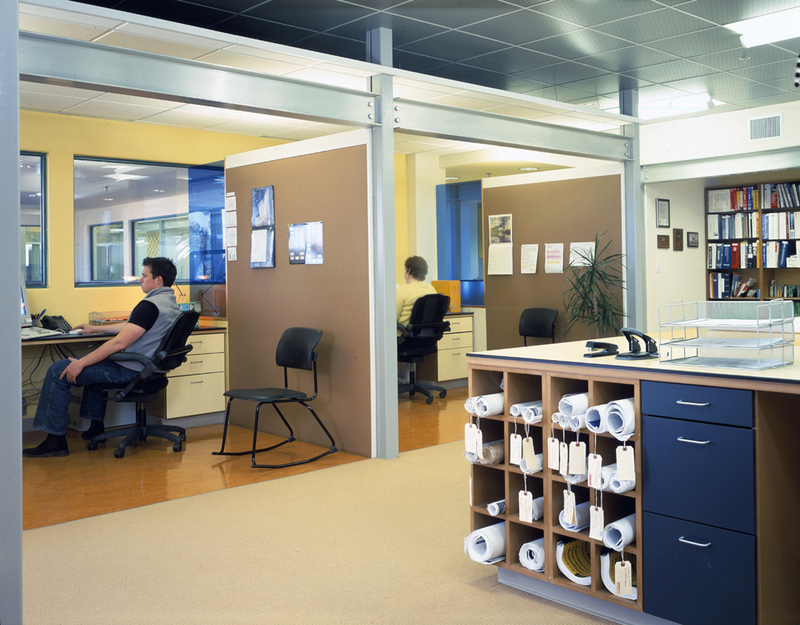 Partitions are held off from the ceiling and capped with linear light fixtures to provide indirect lighting. The ceiling height is modulated to further the spatial dynamic. The client’s product is used throughout the project including casework, countertops, partitions, tables and as suspended ceiling panels. The lobby, while an interior space, is conceptually treated as an exterior courtyard with two Trespa clad facades.